Bill Decker, 69, drops his truck into the lowest gear and punches the gas. The Toyota Tundra whines as its all-terrain tires climb the series of broken concrete slabs that used to be called a road. "This is all public land," Decker says, surveying the surrounding chaparral, tall grass, and rolling foothills that stretch for miles. The truck dips and shakes sporadically as it passes through, over, and in pothole after pothole. DATA POINTS The California Department of Fish and Wildlife estimates that since 1999 the deer population has dropped by more than 300,000, according to its annual estimates. 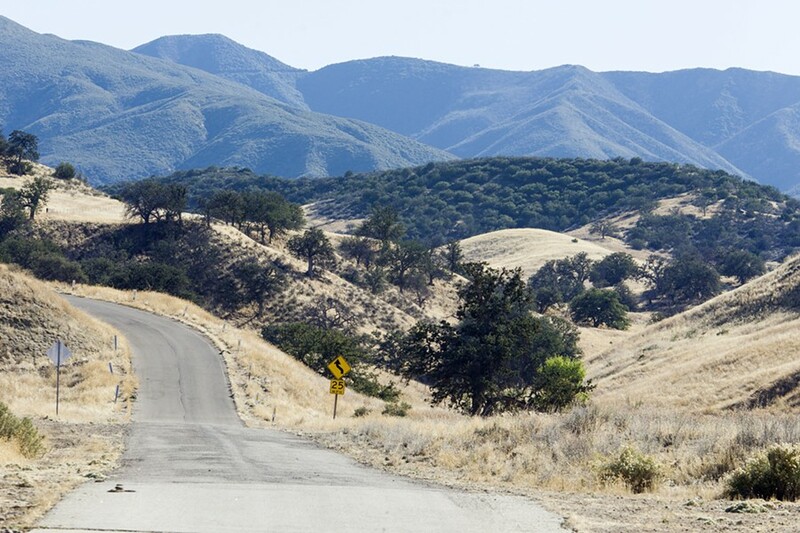 For most, venturing across the stretch of dirt and broken stone deep in the hills north of Highway 166 in Los Padres National Forest would be a daunting endeavor, fraught with broken axels, shredded tires, and shattered self-esteem. Decker, who says he's seen countless vehicles destroyed attempting to tackle the road, is undaunted. He knows the path well from his years as a hunter and, later, as a volunteer for the U.S. Forest Service. Over the past 10 years he's built and installed signs and birdhouses for orange-breasted Western bluebirds. Most days he drives out with a few jugs of water, pouring gallons into open drums for wildlife along a parcel of private land in the Los Padres. His work usually ends with a slow drive out, where he'll stop periodically to lay birdseed, blanketing it across the road as he goes. The truck rolls to a stop on a flat piece of earth surrounded by hills dotted with oak trees. A small stream trickles through a ditch at the base of the closest mound. Decker leaps from his seat and saunters to a large blue plastic bucket that holds about 2 gallons of fresh water he refills each visit. He scratches his snowy mustache as he surveys the area. "Not a single track," he mutters under his breath. "This is what I'm talking about, this is one of the only areas where there's water for miles and I don't see a single sign of deer." 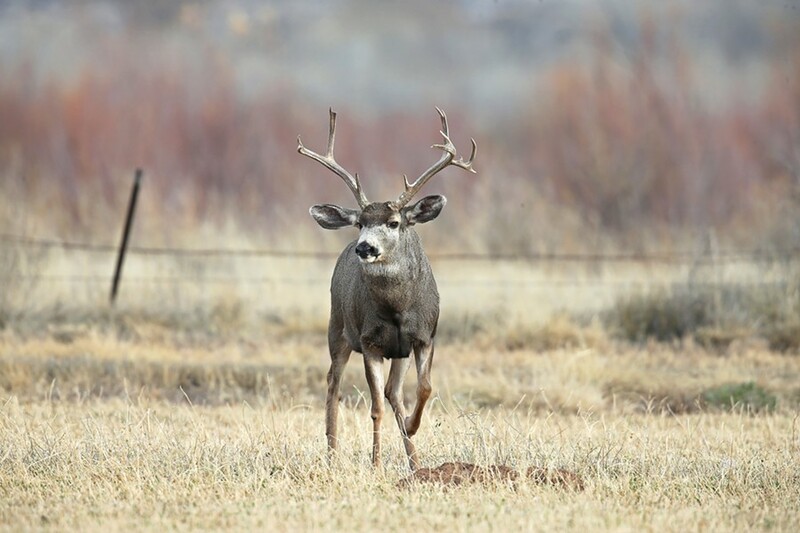 It's early October, mating season—also known as the rut—when deer, sheep, and other ruminants can be found wallowing in the mud, and, if they're male, rubbing together antlers or horns, sometimes violently. "Usually, you would find [dead] deer on the side of the road because of the rut, but I didn't see one on the entire drive up here," he says. "Shows ya there aren't many around right now." He places a large weathered hand toward the sun and looks up. "Hot as can be right now, so we know they're moving." Decker's ongoing theory about the "missing" deer isn't radical. The drought scorched available food and water for half a decade, and rapid, consistent human development is constantly pushing deer out of their traditional habitats, which reduces their population range and weakens their ability to evade predators. These assertions are supported by data from California Department of Fish and Wildlife (CDFW) as well as anecdotal evidence from biologists with the Los Padres National Forest and University of California Davis. Indeed, deer populations have dropped precipitously—by more than 300,000 statewide since 1990—and the scientists who spoke to New Times agreed on how fauna were affected by habitat loss and human encroachment. DEVELOPING PROBLEM Wildlife biologists say that encroachment from humans typically impacts wild animal populations, noting that land developed for vineyards and other areas with high fences seems to have a negative effect on deer population. However, the latter part of Decker's theory holds a little less weight than the former. "The mountain lions are booming right now," he says. "I've been here for 44 years and know guys—hunters and outdoorsmen—that never saw a cougar in their life, and now they are seeing them daily." Decker believes mountain lion populations are exploding because hunters can't shoot them except with due cause or a depredation permit. In 1990, California passed Proposition 117, which made mountain lions a "specially protected species," and illegal to hunt. The legislation came about due to fears that the animal was on the path to extinction. Hunters have bemoaned the legislation since its passage. Decker says the circumstances created conditions that allow the big cats to feast on deer unchecked. Christine Thompson, senior environmental specialist with CDFW, said via email that the agency didn't keep specific population numbers for San Luis Obispo or Santa Barbara counties. She said that in the upcoming winter and spring, department staff will conduct deer population surveys to estimate density and abundance. "The population appears to be stable and healthy," she added, noting there were no disease outbreaks. "A number of deer are attracted to the growing vineyard industry both because of the abundance of available food the vineyard provides and the displacement effect—or deer habitat that is being or has been converted to vineyards." Those properties could create problems down the line for deer and mountain lion populations, according to Los Padres National Forest biologist Kevin Cooper. "If more and more lands are converted to agriculture, particularly grapes with high fences that prevent deer's ability to move through grazing land, it really changes the population dynamics of the deer and of course their predators, mountain lions," he said. The wine industry has exploded in Santa Barbara and San Luis Obispo counties since the moratorium on mountain lions passed. 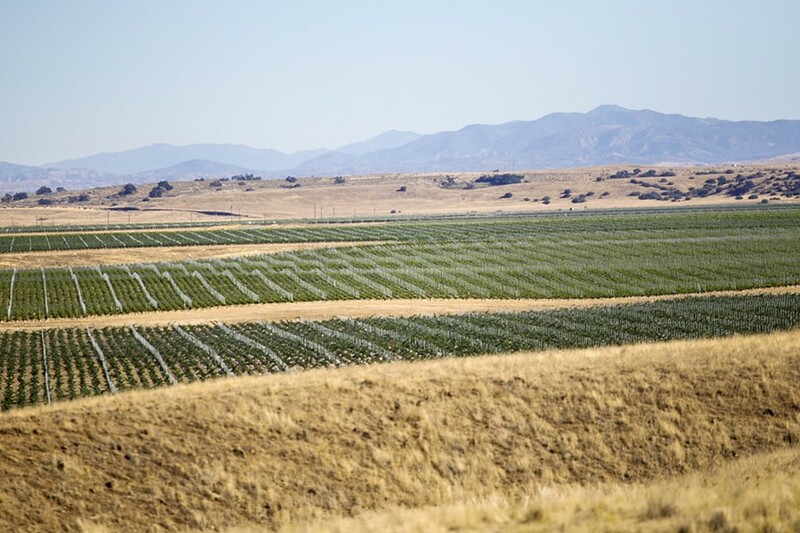 In 1990, Santa Barbara County had 9,542 acres of planted grape vines. By 2017, that number more than doubled to 21,349. A similar story can be said of SLO County, which ballooned from 8,150 acres to 46,307 acres over the same span. And as the wine industry continues to expand, area wildlife numbers will likely contract, according to Cooper. "They would go down in numbers in those areas," he said. "But the populations are probably dropping overall due to a combination of everything: drought, loss of habitat, increased number of predators, and hunting pressure." Accurately measuring animal populations is far from an exact science, according to biologists and wildlife experts. CDFW's Public Information Officer Andrew Hughan said that deer populations were estimated through a variety of methods, including trail cameras, how many tags are purchased by hunters, and in-person observations carried out in the field. NORMAL FLUCTUATIONS While the statewide deer population may be on the decline, Winston Vickers, an associate veterinarian at the Wildlife Health Center at UC Davis and the co-principal investigator of the Southern California Mountain Lion Project, says that these numbers vary year to year and zone to zone. That could be significant in the Los Padres National Forest, which encompases nearly 3,000 square miles and stretches from Ventura to Monterey counties. The department divides its territory into dozens of hunting zones. SLO and Santa Barbara counties fall into the largest zone, which stretches from Carpinteria to north of San Francisco. From 2013 to 2017, population estimates in that zone dropped from 165,250 to 97,520. The numbers mirror a statewide trend dating back almost three decades, during which time estimates have decreased from 850,000 deer in 1990 to a little more than 532,000 this year. "It's real bad," Decker says at the dusty site in the Los Padres. "And it might be too late to do anything about it." On the surface, such a steep decline should be cause for concern, but most wildlife experts agree that population fluctuations are relatively normal. Winston Vickers—an associate veterinarian at the UC Davis Wildlife Health Center and the co-principal investigator of the Southern California Mountain Lion Project—said although deer populations in the state have declined overall in the last 30 years, there is tremendous variation year to year and zone to zone. According to Vickers, humans have the largest impact on animal populations. "I think most people at CDFW would agree that habitat loss and fragmentation are clearly the biggest issues for both deer and mountain lions at the population level, as with many other wildlife species, in California versus predation," he said. Hughan shares a similar sentiment. "Based on our science, our [state] deer population has been stable, and according to our biologists, so are the populations in Santa Barbara and San Luis Obispo [counties]," he said. Hughan noted that the system for measuring wildlife populations is far from perfect and that a firm number for a population of animals doesn't exist. And when an animal is particularly elusive, like a mountain lion, scientists sometimes have to base their estimations off what is known about the animal's basic behavior. "A male mountain lion has a 250-square-mile home range with about three to five females [as] part of his group scattered about parts of that range in 100-square-mile to 150-square-mile sections," Hughan said. "They'll pretty much go anywhere as long as there's food, water, shelter." Currently, there are an estimated 4,000 to 6,000 mountain lions living in California, compared to 2,000 in 1970, according to the CDFW. Hughan said to even attempt to give a specific population number for a particular area would "most likely be wrong and irresponsible." But Vickers said experts were much more concerned about the Southern Californian mountain lion having the downward trend in population over the past few decades than they were about deer populations. Researchers track the great cats through a combination of radio collared monitoring and genetic analyses taken from samples when the animals are captured before being released back into the wild. In a research paper Vickers co-authored with scientists from UC Davis, The Nature Conservancy in San Francisco, and the CDFW, the writers note that despite protection from hunting, the survival rate for radio collared mountain lions was "surprisingly low (55.8 percent), and humans caused the majority of puma [lion] deaths." The most common source of mortality was vehicle collisions. "It's certainly not booming," Vickers said of the Southern California mountain lion population. "In some areas it may be down due to high mortality rates and inbreeding that may affect population stability, but generally CDFW feels that lion populations are mostly stable, except for the coastal mountain populations." Decker disagrees. He argues that visible signs of an increased, emboldened mountain lion population are evident, especially in areas that would normally be thick with deer. "I went up and hunted on some land right on the border [of the Los Padres] not far from here and we didn't see a single [deer]," he says as he scans the hills dotted with dead and drought-stressed trees on the private land in October. "But we saw signs of mountain lions. The Forest Service would know that if they had less people at desks and more people out in the field." Hughan told New Times that his office receives reports of mountain lions on a nearly daily basis. He said that many of those reports proved to be inaccurate and were treated case by case, but largely with a grain of salt by department staff. "There's no science that says there's more lions, but there's absolutely been more sightings," he added. Hughan attributed the increase in sightings to three factors: encroachment on habitat, habitat loss, and the prevalence of cellphones and social media. "It's not that there are more animals, it's everybody has a camera in their pocket," he said. "It's important to remember that sightings are purely anecdotal." As for the ban on hunting mountain lions that Decker says is devastating the local deer population, Hughan expressed some skepticism. "There's no evidence that points to the populations booming since 1990—when the moratorium went into effect," he said. "If someone says there's less or more mountain lions or deer anywhere they would have to be hunting for 35 or 40 years. So it's possible, sure, but there's no science that supports the theory that the moratorium has any positive or negative effect on mountain lion or deer populations." Biologist Cooper noted that the mountain lion population, especially in the the Los Padres National Forest, was by all accounts stable and healthy. READING THE SIGNS Bill Decker has hunted deer on land in and around the Los Padres National Forest for more than 50 years. He told New Times he's never seen a drop off in deer numbers like he has in recent years. "I would say most biologists would agree with me that mountain lions are fairly common," he said, adding he lives in San Luis Obispo and sees signs of the cats while hiking in the hills around town regularly. "The numbers are probably pretty high and they definitely have an effect on deer populations and, if they eat a fair number, they can make a difference in those herd sizes. But as for the deer being taken out and down to zero from hunting or something like that? I don't think that's ever going to happen." Cooper again pointed to the myriad problems associated with tracking wild animals. "They are really difficult to get a handle on and find," he said. "I mean, they are right here under our noses all the time and almost no one ever sees them." Back out in the hills north of the Highway 166, Decker sighs as he adjusts the scope on his hunting rifle. "Sometimes I think I'm the only one out here in the forest seeing the signs and crying to myself," he says. He loads his gun into the truck and idles before inching the vehicle toward the brown, bumpy, battered road to civilization. 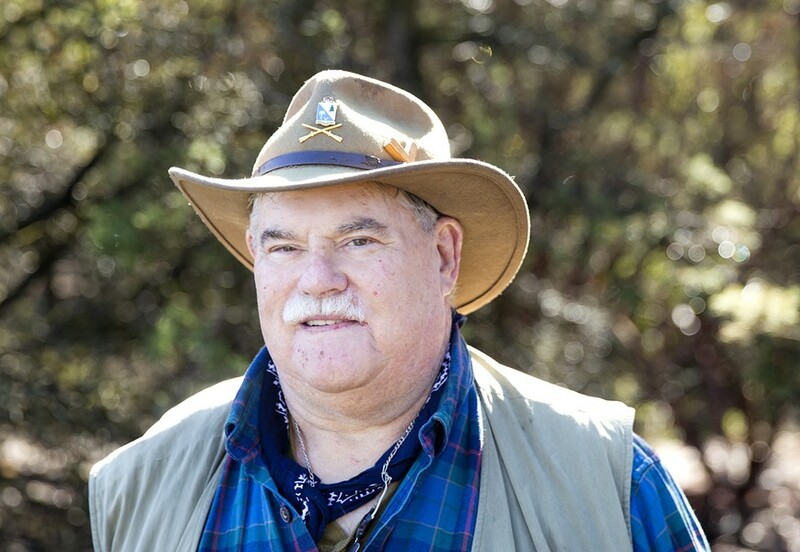 After a full day in the woods, Decker is loose and talking freely about his times as a reserve police officer in Guadalupe, stories he peppers with a few hunting tales from yesteryear. Suddenly the truck screeches to a halt. Sun Staff Writer Spencer Cole from New Times' sister paper can be reached at scole@santamariasun.com.